Emplotime allows setting the time clock page centralized in the reception's PC and also on every employee's PC. If you have a company with several employees where every employee clocks In and Out from his own PC, the best practice will be setting this PC as a "Personal Device". Emplotime version 2.4 allows you to easily set a time clock page for single employee use by clicking on the new "Personal Device" toggle button. 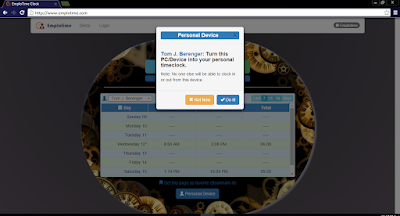 After clicking on the "Personal Device" button, the clock page will be adapted for single use by retrieving only the selected employee data transactions. Every given employee is allowed to click the "Personal Device" button and turn his own PC into his personal clocking device, and you, as his manager should encourage the employee to do that. Emplotime Location Feature has evolved to Geolocation Feature. By selecting this feature, the company's manager/administrator will be able to receive an accurate location for the clocking In and Out transactions of their employees Employees will no longer be requested to manually provide a working location from a list, since from now on, the clock page will automatically provide the geoposition of the Employee at clocking time. How to select this feature? After selecting the Geolocation feature, the clock page will try to collect the geoposition of the employee whenever is possible, no matter if the clock page is opened from a PC, tablet or mobile device.